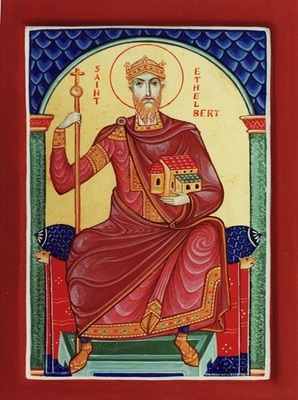 Saint Ethelbert, King of East Anglia. Æthelberht (Old English: Æðelbrihte), also called Saint Ethelbert the King, (died 20 May 794 at Sutton Walls, Herefordshire) was an eight century saint and a king of the Anglo-Saxon kingdom of East Anglia. Little is known of his reign, which may have begun in 779, according to later sources. It is known from the Anglo-Saxon Chronicle that he was killed on the orders of Offa of Mercia in 794. He was subsequently canonised and became the focus of cults in East Anglia and at Hereford, where the shrine of the saintly king once existed. In the absence of historical facts, mediaeval chroniclers provided their own details for Æthelberht's ancestry, life as king and death at the hands of Offa. His feast day is May 20. Several Norfolk, Suffolk and West Country parish churches are dedicated to the saint.